In the previous episode, we created our first model-driven API endpoint. 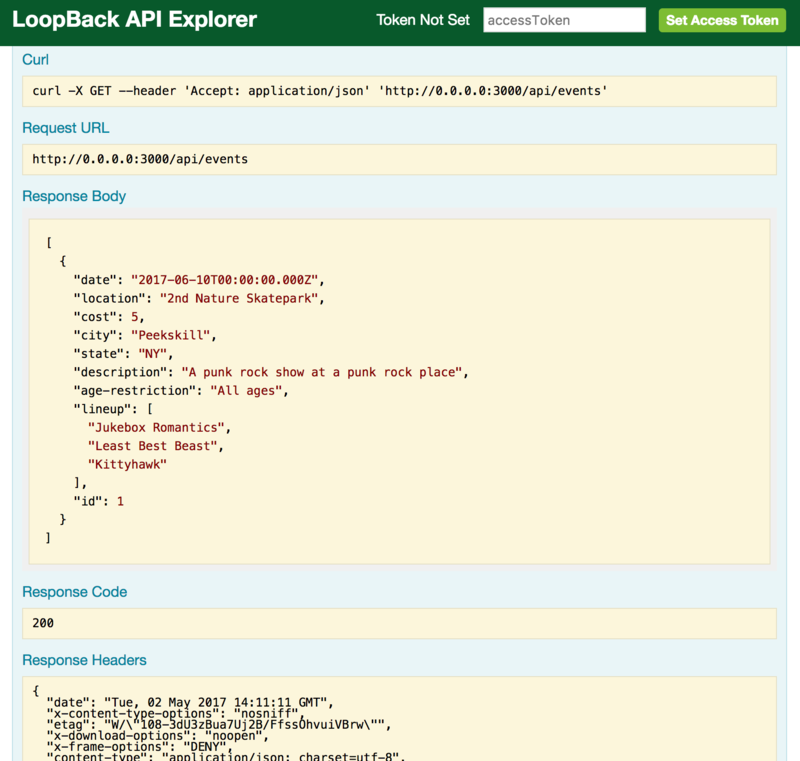 We used the LoopBack CLI, which asked us a series of questions about our data and then built out our RESTful API endpoints based on the answers we provided. We took a moment to look at the files that were generated, but now we will actually see those endpoints in action. 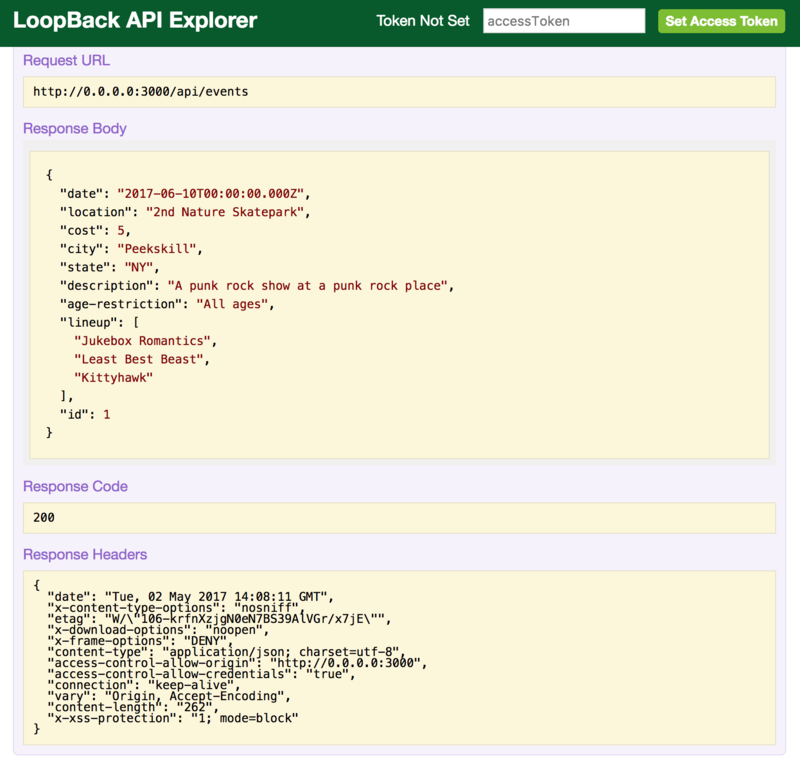 In this episode, we will learn about the Swagger UI Explorer that comes with LoopBack and allows us to “explore” our APIs. 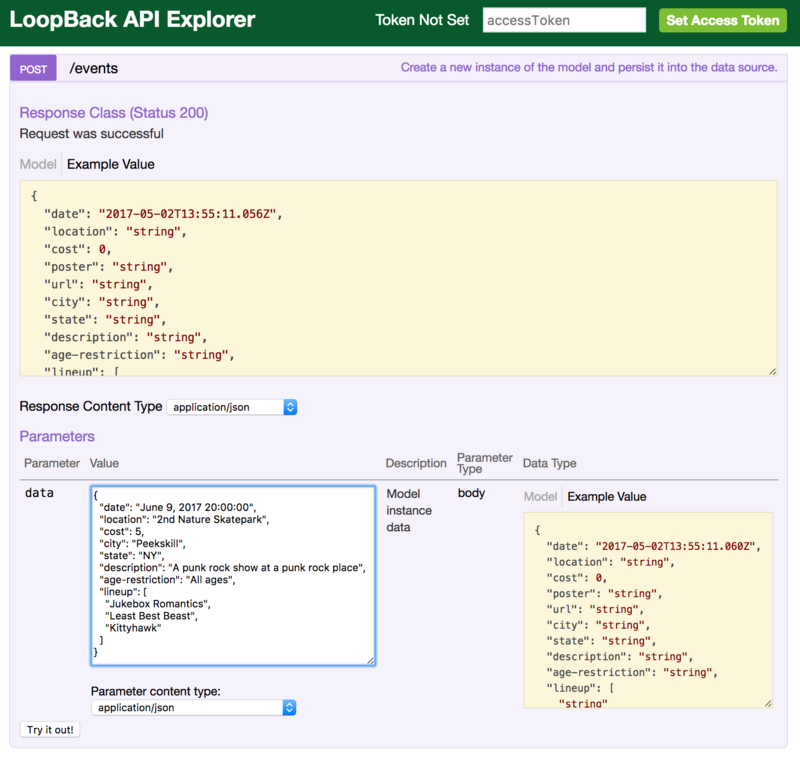 We can see all of the endpoints that LoopBack has created for us as well as interact with them within the browser. 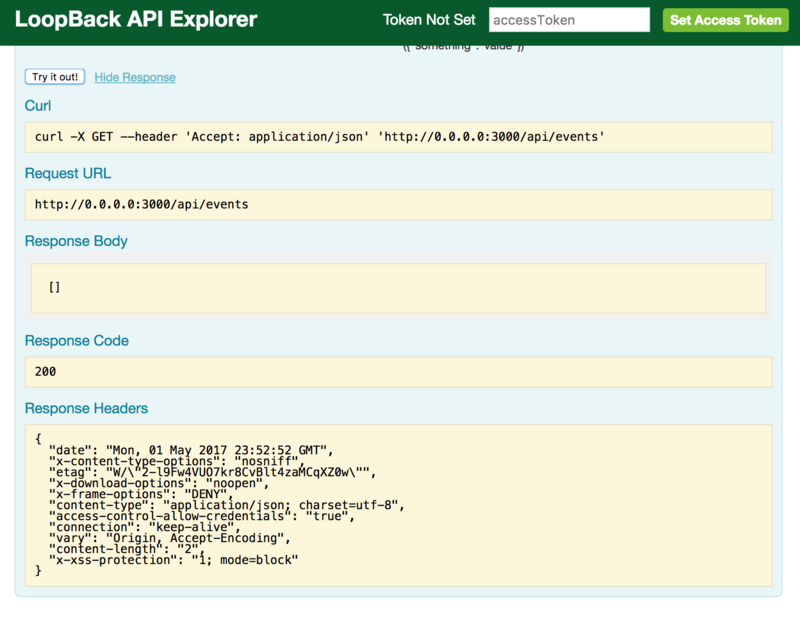 We’ve initialized a LoopBack application and built our first model-driven RESTful API endpoint for events. Let’s run the application using node . 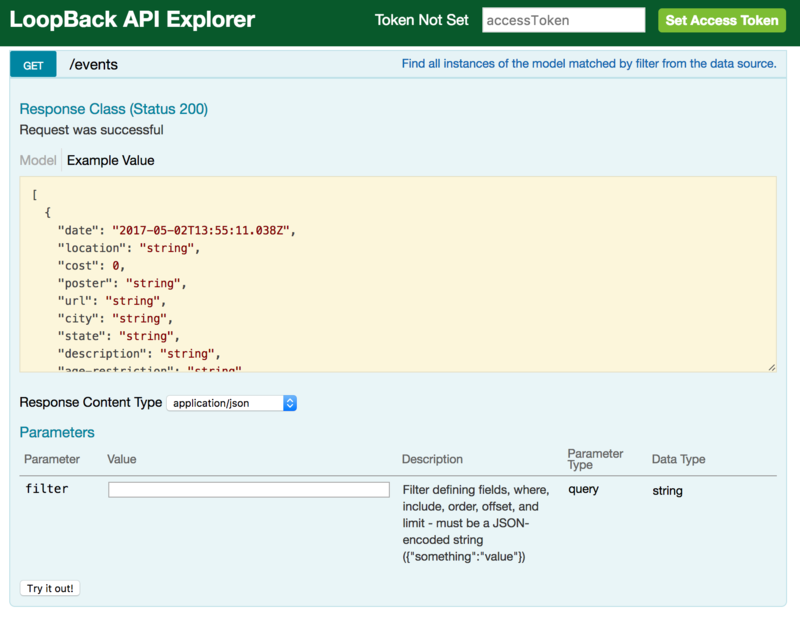 and take a look at the API Explorer UI. ➜  band-app git:(master) ✗ node . As we can see above, we have started our node.js application – upon startup, it helpfully tells us what URL our application is using as well as the URL to the API Explorer. Let’s click on the Explorer URL and engage with our endpoints. Pro tip: most terminal applications will launch a URL if you cmd + click on the text. The browser opens up to a page that lists our API endpoints. We’ll see one for event and one for User. The User endpoint is the base class that is provided by the api server option we chose when initializing our application. It is the class that we would extend from when making any sort of user-based role; members, for example. Pro tip: a programming convention is to name Base classes with a capital letter. Reminder: Base classes are the ones that you do not edit directly, but instead extend from. The event endpoint is the one created in the previous step based on our answers to the prompts. A GET request - Try it out! In addition to providing some request examples (Curl and URL), we also see that the GET request is successful with a 200 response, but the response array is empty. That’s because we don’t have any data! We’ve only described our data, but we haven’t actually added any to our data-source. Let’s try adding some data using the POST method. Pro tip: To learn more about HTTP responses, check out this list of http status codes. One of my personal favorites is 418 - I'm a teapot. If we scroll the page down the list of HTTP verbs, we will see a few POST options. The first one should be POST /events. Let’s open that panel by clicking on it and we should see a similar panel to the GET one we saw above. A POST request - Try it out! After entering this data into the text field, we can click the ‘Try it out!’ button to POST this data to the endpoint. Yay! Again, we get the 200 response and this time, the GET request returns an array with the object we had submitted in the previous step. Exciting, right? Note: we have not hooked up a datasource yet. If you remember, we chose the “in memory data store” when creating this model. Therefore, every time you restart your node app, you will lose all the data you have created. We will hook up a datasource in an upcoming episode. Until next time, if we want to “explore” this a little further, we could try making these requests through our command line with cURL requests or by hitting the endpoints directly in the browser. We may even want to start implementing these requests in some HTML and make AJAX requests to get data. This should keep us busy for a few until next time! Now we have a handle on creating our first model within LoopBack and seeing it in action, let’s dive a little deeper: in the next episode, we’ll break this model down a little further and create a couple “related” models.